When did God make America? 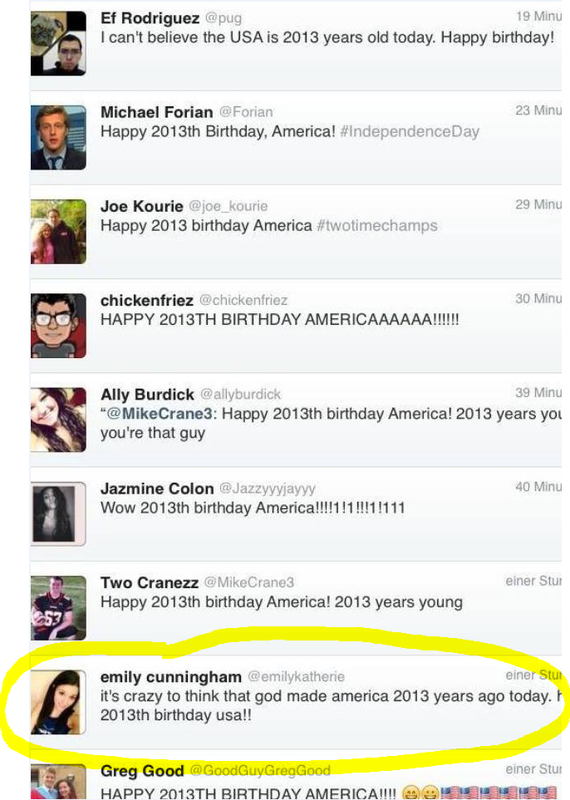 It’s over a week out of date now, but I ran into this trail of 4th of July tweets and found them amusing. I don’t know how many of these tweeters were Leno-man-on-the-street level idiots, but it turns out this particular one was actually making a sarcastic joke, and spent her 4th enduring all the hate the internet could spew at a 17 year old girl. So I guess there are a lot more of us R2K crazies than I thought, if so many are coming out of the woodwork to criticize the notion that God made America! This entry was posted in Church and State, Civil religion, Friday fun, Humor, Outhouse Quick Hits, Quotes, Some fun. Bookmark the permalink. 3 Responses to When did God make America? I don’t know whether I should be sad or amused! If it’s up to me, how about I mandate that you be amused? I would guess most of those are intentionally joking, but maybe I’m too optimistic? I am really laughing right!